This study, one of six case studies to support a 'First Pass' National Climate Change Coastal Vulnerability Assessment (NCVA), examined the sea level rise and flood vulnerabilities for the local government areas of Newcastle, Lake Macquarie and Wyong in New South Wales. The study involved biophysical and social-ecological modeling of both the present and three projected, future landscapes for the study area; investigated a wide range of social characteristics drawn from the 2006 census; surveyed the attitudes of the local population to assist in the social analysis; and analysed key concepts, such as the costs and benefits of adaptation to climate change. 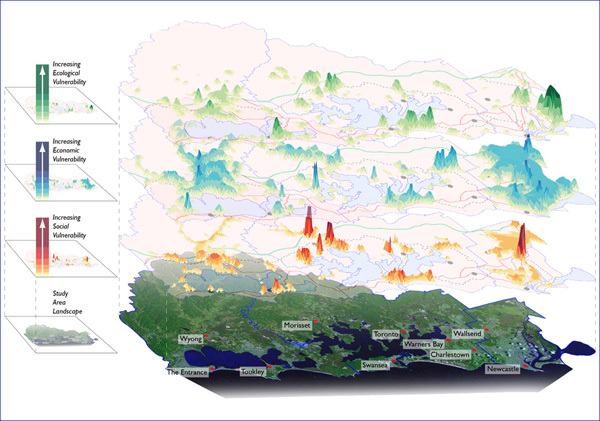 These data, spatially attributed as maps and 3D 'surfaces', demonstrated the areas of ecological, economic and social vulnerability from future climate change. A summary of policy and related recommendations using sea level rise and climate predictions for 2030 and 2070 scenarios was provided to the Federal and State governments and related Councils. The peaks on the surfaces represent localities with relatively high vulnerability compared to other areas (higher peak = higher vulnerability).